How are light, medium and heavy duty tows classified? Generally anything under 10k lbs is light, 10,001k – 26k is medium and everything above is heavy. Regular vehicles or trucks, like a Honda or Ford F-150, would be light. Vehicles like bobtails, U-haul trucks or lunch trucks are medium. Buses, cement mixers, trash trucks, tractor trailers, etc. are heavy duty. Where do I need to be located to get a tow from Pepe’s? We service all of LA County including the Long Beach area, Inland Empire, Orange County and anywhere else in California, from San Diego to San Francisco. How long does it take for a tow truck to come after a call? We have a large staff of drivers that can leave the shop as soon as we get a call. However, our ETAs vary based on the current traffic conditions during the time of the call. What does it mean to be a OPG unit in Los Angeles? We have a contract with the city to be the exclusive heavy-duty OPG. This means that LAPD and the Department of Transportation use Pepe's exclusively for heavy duty impounds and accident recoveries. For more Information, please visit www.opgla.com. How are rates for a CHP tow determined? If you are stranded on the freeway and we are called by the California Highway Patrol to tow your vehicle, we charge per hour according to the weight class (light, medium or heavy) at the respective current hourly rate. We cannot charge more or less per hour than what we are currently contracted by the city for. How do I pick-up my vehicle that was impounded? You may pick up your vehicle Monday - Friday, from 8am - 6pm. OPG impounds may be picked up Monday - Saturday from 7am - 7pm. All towing and impound fees must be paid at the time you are picking up your vehicle. If there is a hold on your vehicle, we cannot release it until you obtain a release form from the agency (CHP or LAPD) that impounded your vehicle. You must be the registered owner with a valid driver's license or have authorization from the registered owner. What types of tow trucks does your company operate? 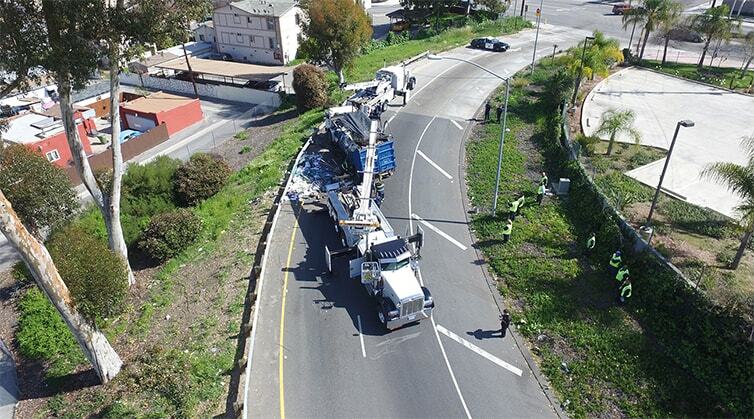 We have a large fleet of mainly Peterbilt tow trucks ranging from light duty flatbeds to the city of LA's only 75-ton Rotator.